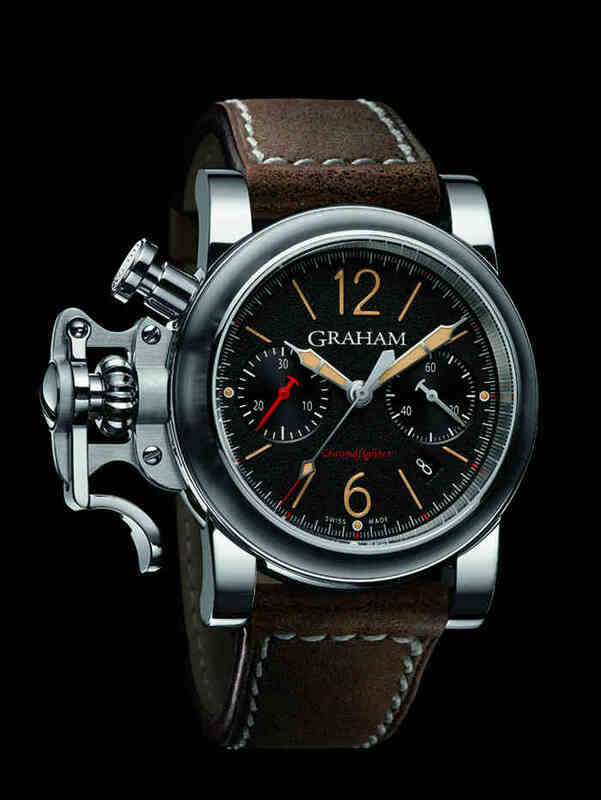 By presenting its new model: The Chronofighter Fortress, Swiss luxury watch brand GRAHAM LONDON, pays homage to the watches worn by the aircrews of RAF ( The British Royal Air Force) Bomber Command during dangerous 1940s . In the beginning, stopwatches used by flying officers were in fact just large pocket watches strapped over bomber jackets. Nonetheless, they were vital pieces of equipment used to follow flight plans and to time air raids. Already these early watches had to be trusted by the aviators as a matter of life and death. They were praised for their reliability and precision. These watches had to work high up in a world made of adrenaline and excitement where the freezing temperatures of high altitudes reign supreme. They were operated by men clad in heavily lined leather jackets and big gloves, strapped into their seats, in the confinement of a flight deck in combat. And after dark, on a night mission, in the dim glow of the cockpit instruments. More than enough reasons to design and develop a specific system to activate the chronograph without fail – the result was the now famous lever. The lever is a device which allows the crew-member to operate the chronograph intuitively under stress, while wearing those heavy gloves. It is a fail-safe system which does not distract the wearer from vital tasks because the left-hand lever is effortlessly reached with the right hand. The thumb, the fastest of all fingers, starts and stops the chronograph. The result is precise timing. The Chronofighter Fortress is an authentic watch that recalls these times. Fixed on a bomber jacket leather strap, the 43 mm case features a black dial with beige Super-LumiNova numerals, indexes and hands. They are the exact shade of aging Tritium found on historic military timepieces. The chrono seconds and minutes counter hands are red, bringing out the chronograph functions. With its vintage look, this time instrument embodies a part of British aviation history. Like the fuselage of a Flying Fortress, the case presents a subtle mix of brushed and polished steel, playing with the light, combined with a completely transparent case back. The R.A.C. (roue à colonnes) device is the most elegant and precise mechanism to control the start – stop – reset functions of the chronograph. The blue propeller shaped column wheel is recognizable by its seven polished triangular segments. Each starts or stops the chronograph by activating numerous levers. Or they allow the resetting of the counters. Finally, the distinctive and prominent lever on the left side of the case represents the essence of the Chronofighter collection. 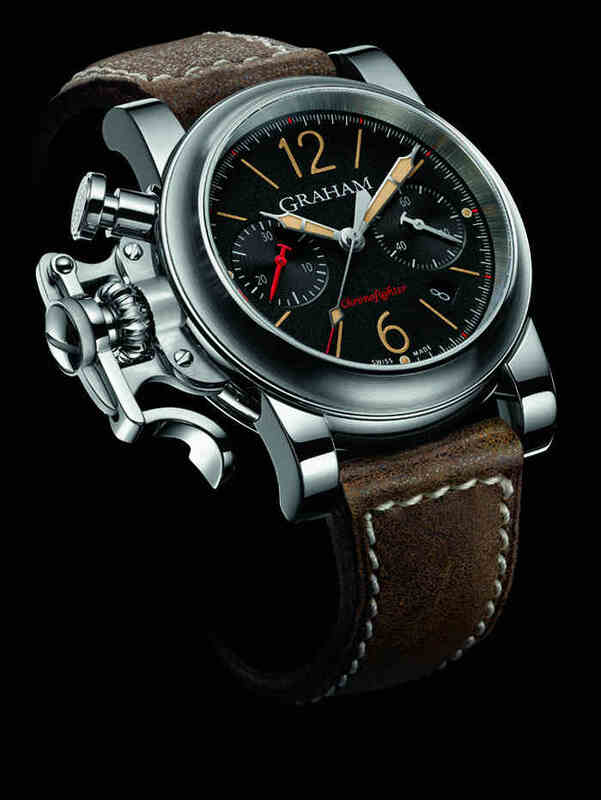 Suggested retail price for GRAHAM LONDON Chronofighter Fortress is 7’950 CHF.